Lime and coconut reminds me of summer, the beach, the ocean, and drinks with little umbrellas. So while I was thinking of drinks, I pulled out the tequila our friends brought us back from Mexico. Tequila and lime play well together, so why not have a little fun. I found some Campfire Key Lime Mallow Bursts at Walmart that I have been dying to use. I did not find any key limes at the grocery store however. So I just bought whatever limes I found. I did end up adding a few dabs of Wilton's Leaf Green coloring gel to the Rice Krispie Treats at the end just to give it a little more color, but it is not necessary. My daughter was really loving the smell of the limes. She was very disappointed when I told her that she would not be able to eat these treats because they contain alcohol. I will have to make them again for her without the alcohol. Since I didn't add a lot of tequila in the treats, I added some more to the topping. And it made the marshmallow fluff more spreadable. In the end, the treats came out wonderful. They have a nice tart lime flavor, balanced with the sweetness of coconut. There is not a heavy alcohol presence. I couldn't add anymore liquid than I did, because the treats would have fallen apart. Although you could try replacing the lime juice with more tequila. Or you could skip it altogether and enjoy the lime/coconut party. I like that they are not too sweet and you can definitely eat more than one without having a sugar overdose. This turned out to be a great summer-is-almost-here dessert! Remove from heat and add lime juice, lime zest, and tequila. Stir until completely mixed. Then add the Rice Krispie cereal. Mix until all is well incorporated. Then add food coloring gel if desired. Stir until completely colored. In a small bowl combine the marshmallow fluff and tequila until completely mixed. Spread the fluff mixture over the top of the cooled treats. Then evenly sprinkle shredded coconut on top, pressing down slightly with your hands or a piece of wax paper, so that the flakes adhere to the fluff. Next, slice, eat and enjoy! I love anything with lime! These treats sound amazing! Love the topping too! Thanks Liz. 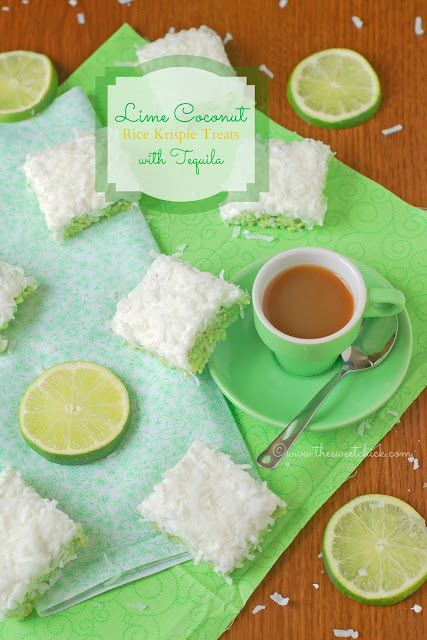 These are definitely for lime lovers!